Much has been made of yoga’s lack of inclusivity in recent years. 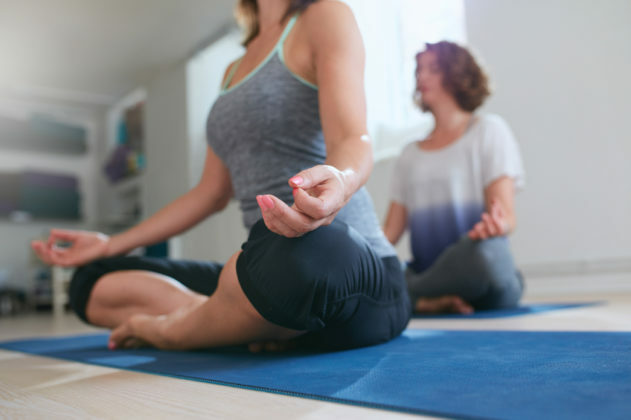 The practice might have hailed from India, but it’s long been associated with white, lithe, and affluent women; a 2008 NIH study showed that 85% of U.S. yoga practitioners were white and 79% were women. Even so, London is one of the most multicultural cities in the world, and Camden—the location of my studio—was home to some of the most vibrant multicultural communities in the capital. I expected to see at least a few brown faces. At the launch of a cold-pressed juice bar, I was still the most “visible” person in the room. When I looked at a health magazine, I saw not one woman of color featured in the pages—and just one on the editorial team. It finally dawned on me: The class, the juice bar, and the magazine weren’t one-off events. On the contrary, they were reflecting a troubling reality—and sending a troubling message. Women of color like me aren’t just invisible in health and wellness. We’re not welcome. Women’s health, it appears, is assumed to be the sole preserve of white women. Even a cursory glance at newsstand health magazines shows that they are undeniably marketed to a white audience. Of the past 27 issues of Women’s Health UK, just two have women of color have been on their covers—and those women, Zoe Saldana and Chrissy Teigen, are light-skinned, especially close to a beauty ideal that is based on white women. Of the most popular books published in 2015 by Yellow Kite Books, a leading publisher specializing in well-being and health, not one featured a non-white author. Just take (white) gluten-free blogger Deliciously Ella, arguably the poster-girl of the #eatclean movement in the U.K., who first made plant-based eating fashionable back in 2015. Others soon followed suit: The Hemsley sisters popularized spiralized zucchini and bone broth, while nutritionist Madeleine Shaw encouraged us to copy her radiant perfection and #GetTheGlow. As I’m writing this, Deliciously Ella has amassed 885,000 Instagram followers, with Hemsley & Hemsley trailing behind at 252,000 and Shaw at 245,000. Beyond their artfully placed shots of energy balls, all have built thriving empires that show little sign of slowing down. Deliciously Ella’s cookbook became the fastest-selling debut cookbook of all time, her app shot straight to number one on the iTunes chart on both sides of the Atlantic after just a week, and she’s recently opened her first deli in an exclusive London postcode. The Hemsley sisters, meanwhile, have their own TV show and a café on Selfridges Oxford Street. Their success doesn’t come from credentials. Deliciously Ella isn’t a licensed nutritionist (at least not yet) and the Hemsley sisters have no traditional qualifications. But they all possess the qualities that seem to matter most in the digital age: All are attractive, lithe, and—crucially—white. Essentially they’re sending the message “cook like me, look like me”—which works, as long as they’re speaking to an audience that already does (or at least can) look like them. This possibility, so within their reach, keeps them coming back for more. Ironically, even as people of color are noticeably absent from the clean eating movement, the movement’s success depends on appropriating from non-white ethnicities. It’s not just yoga. Ethnic foods—the same foods that POC were once shamed for eating—have now been repackaged and commodified to the masses as part of the wellness trend. Za’atar, tahini, Medjool dates, and zucchini—staples of my Lebanese diet from my Beirut-born mother—seemed “foreign” or strange to my school friends who ate ham sandwiches and Salt ‘n’ Vinegar crisps, but all now feature in Hemsley & Hemsley recipes. Greek food, too, has been absorbed into the movement; a Greek friend who had scorned her culture’s food is starting to embrace it now that it’s “fashionable.” It’s frustrating that health bloggers pick and choose from cultures like mine when it suits them, but the real injustice is that their advice is only deemed worth heeding because it comes from a white face. The lack of diversity in wellness certainly seems to be a global issue. While much has been done to promote black visibility in the U.S. vegan movement—actress Taraji P. Henson and hip-hop artist Waka Flocka Flame are among the most high-profile, while black vegan feminist Aph Koh, founder of Black Vegans Rock, launched a “Top 100 Black Vegans” list in April 2016—black veganism arguably remains a separate movement entirely. The mainstream veganism movement has come under fire for racism, from its routine comparison of animal farming to slavery to its suggestion that black human lives are worth less than animals’ lives. When this remains largely unchallenged—even acceptable—it’s little wonder forums are rife with WOC reporting their sense of isolation from the movement. Even critics of the “cult of wellness” tend to focus on the idea that leading wellness figures are peddling misinformation or promoting disordered eating, rather than questioning the movement’s lack of racial diversity. Take parody Instagram account @DeliciouslyStella. The comedian who runs it satirizes the clean eating craze—typical posts include statements like “I’ve been trying to get some colour into my diet so today I’m starting my day with some skittles and a rainbow bagel”—but not the sea of white faces that dominate it. Salma Haidrani is a London-based award-winning writer. Her writing has appeared in VICE, Refinery29, GLAMOUR, and Cosmopolitan, among other publications. She’s also a heliophile and if she closes her eyes enough, she pretends she’s in Miami in its heyday.